When Panasonic's G1 camera was released at the tail end of last year, there was an exciting feeling that the device could open up the DSLR market to consumers who would never have thought of getting rid of their compact and upgrading to a mid-range shooter. 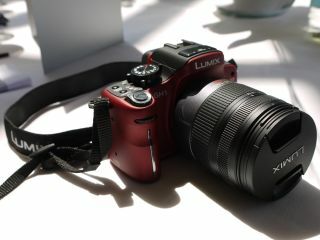 The beauty of the camera was that its compact size meant that it didn't scare newbie snappers away from the DSLR market. This is all down to Panasonic's much-heralded Micro Four Thirds system. Its successor, the GH1, is the same in body as the G1 but in spirit it packs more of an imaging punch – in the form of HD video shooting. Here at TechRadar, we have had many a reservation about why you would want this feature on a camera. It's the same the other way around – still-image shooting on a camcorder is rarely an enjoyable experience, more of an afterthought after you have shot all the footage you need. But then we saw what the camera can do in the hands of a moviemaking expert. UK filmmaker Philip Bloom, who has worked for the Discovery channel HD and Channel 4 HD among others, demoed the feature to us in the guise of two short films, which were brilliantly conceived and superbly shot, completely turning the HD video setting from an apparent gimmick into a viable and valuable feature on the camera.